From time to time I have fun looking through old patents... it is admitedly an odd intererst, but the ingeuity of people never fails to amuse and amaze me. 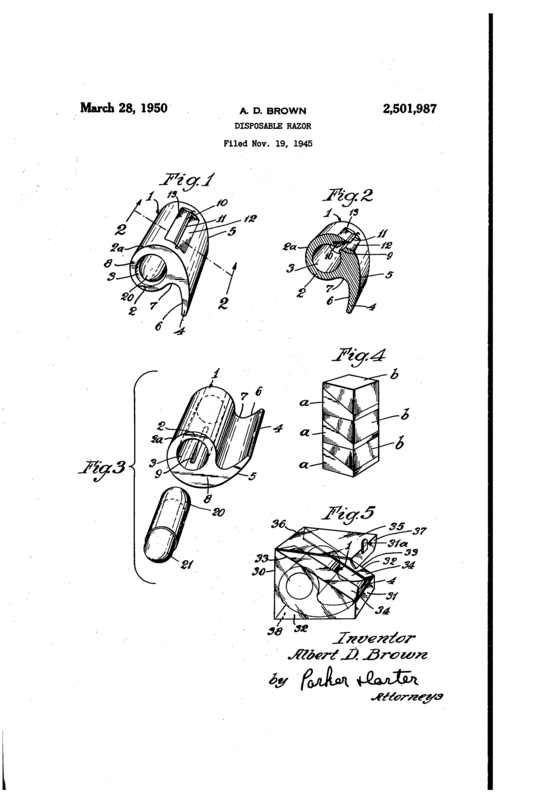 Quote: My invention relates to an improvement in shaving devices or safety razors, and has for one purpose to provide a dispensable razor or shaver. Another purpose is to provide a razor or shaver adapted for a quick and emergency shave for those who find themselves without the usual shaving facilities. Another purpose is to provide a packaged shaver which includes or carries enough brushless cream for one shave. Another purpose is to provide an improved package assembly for dispensable shavers. While the shape Mr Brown came up with perhaps isn't the most ergonomic of shapes for a razor, I do like the way he carried a small tube of brushless cream inside the handle. Quote: The abovedescribed container is so proportioned that it can be stacked in pairs, each pair forming together a rectangular body as shown at small a, small b of Fig. 4. As many pairs as desired, arranged to form such rectangular bodies, may be stacked or packaged in a large container. In Fig. 4 I illustrate six containers arranged in three pairs, which, after being stacked or assembled, may be packaged or handled as a larger unit Also they may be loosely stacked, as shown in Fig. 4, for handy disposition in a show case or on a counter. (11-02-2017, 10:49 AM)bullgoose Wrote: Very interesting. Should be reasonable easy to replicate in this day and age of 3D printing and CNC machining, if someone have timer to spend. Edit: The basic shape at least - the blade geometry might be tricky.